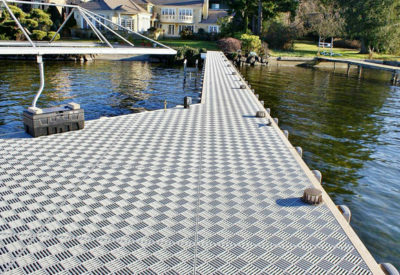 TrueDeck creates a beautiful overall tiled appearance wherever it is installed on piers or floating docks. Its surface is slightly nubbed for skid resistance and is very comfortable for all sizes of bare feet to walk upon it. Truedeck is also low maintenance. Routine pressure washings are recommended as needed to remove any slippery moss build-up respective to a customer’s marine environment. Waterfront Construction is your TrueDeck source, we are at your service to meet all of your unique waterfront needs. See engineering and daylight penetration documentation provided below for further reference to specific applications. Ready to enhance your dock with TrueDeck?